Humankind’s curiosity driven quest for discovery is so strong that it propelled us from exploring different continents to exploring different worlds on both the cosmic and sub-atomic level. We are putting the answers to our universal puzzle together one piece at a time. The moon has a special meaning to me. It is my quintessential symbol of human exploration and discovery because I am old enough to have witnessed the first moon walk live. I only wish I could be present for all great discoveries. Categories: Five Line Poetry, Photos, Poetry, Prose, Tanka | Tags: Photos, Pic and a Word Challenge, Poetry, Prose | Permalink. Perfect! 😄 I really like it! Love the illusion of the moon dropping thru the basket! Thank you! 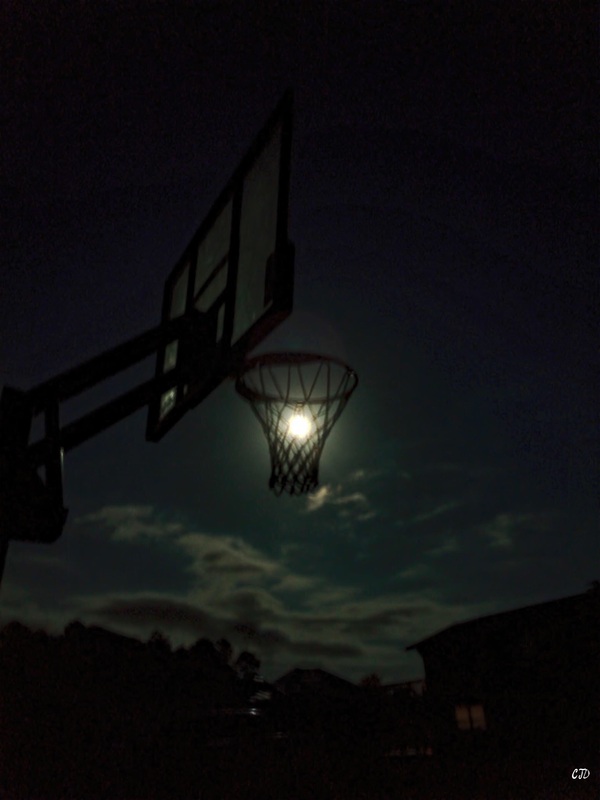 I was trying to get the full moon a few weeks ago and saw this image as I walked past the neighbors hoop. I couldn’t resist. Lovely words, as always. And I love your fearlessness with darkness… I always want to fill in the details, but a large field of blackness works so well in this image. Nice! Thank you. I felt the subject was a bit of a stretch but I really do believe landing on the moon and now our deep space exploration epitomizes mankind and the need to discover. It is also my hope that the human need for discovery will ultimately unite us as a species. And, hopefully, I think you’re right about the spirit of discovery being a unifying one.